Good traffic data is hard to find. For most commuters, an in-car navigation system is only marginally helpful. There's often a delay due to how the official highway traffic reports are fed into your GPS, and side streets and minor roadways are often ignored. That's why the Waze app for iOS and Android, based on user-generated traffic data, has been so popular. 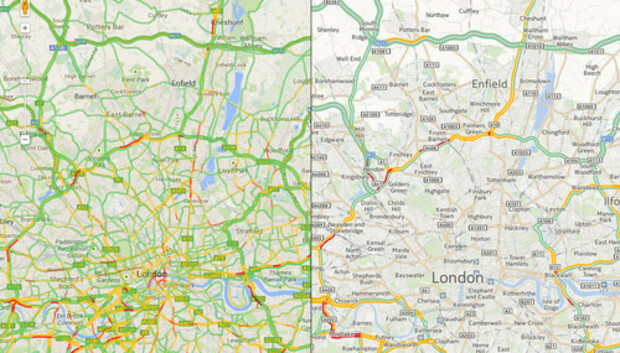 Now Waze has a competitor offering more: UK-based company Inrix has announced Inrix XD. Available starting today for Android and iPhone users, Inrix XD's data analyzes everything from accident reports, the impact from local events, construction zones, road sensor data, and reports from fleet vehicles. Inrix says the traffic info shows speed delays in 800-foot increments and, by next year, will include data for 4 million miles or roads. (The app currently covers 2.8 million miles of roads in 37 countries.) A company official told TechHive.com that, even today, if you were stand on a sidewalk near a road that's tracked by Inrix, a vehicle sending traffic data would pass by every two minutes. The underlying tech will also feed into the traffic reports for the VW GTI, and in many BMW models that use the Advanced Real-Time Traffic Information (ARTTI). The challenge, of course, is that Waze is on a roll. The app rates 4.5 out of 5 on the Android store with almost one million votes. Inrix has a paltry 4,00 votes and a 4.0 rating. And, both apps has a limited shelf life. The US DOT is already researching how car-to-car communication will work using Dedicated Short-Range Communication (DSRC) signals between cars. Eventually, you'll know about congestion automatically as reported by the cars in front of you. VMware interview: If virtualisation continues, what will the future look like?